As the video shows (above, right), sound vibrations move through the air like waves moving across the water. 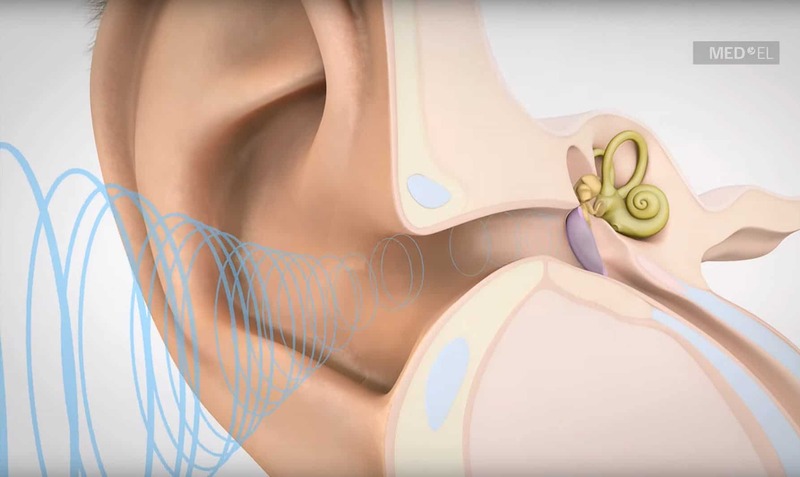 Hearing begins when the vibrations reach the outer ear (left figure 1), which acts to funnel the vibrations through the ear canal (2) toward the eardrum (3). The inset shows sound vibrations interacting with the eardrum, before transferring to a series of three tiny bones in the middle ear (4). These bones further amplify the vibrations of the eardrum, then transfer them to a sensory organ in the inner ear, the cochlea (5). Tiny sensory hair cells lining the cochlea are responsible for transforming the sound waves into electrical signals that are interpreted in the cerebral cortex of the brain (watch the video above, right). The cochlea changes sound waves into nerve impulses, which are then transferred to the auditory cortex (part of the temporal lobe) of the brain via the auditory nerve, for processing. Processing includes decoding the frequency distribution of the information contained in the neural impulses for meaning and spatial recognition (where is the sound located, and what does it mean). In the figure below, the cochlea (A & B) is filled with fluid, and lined with tens of thousands of tiny hair cells (C & D). The figures (A-E) show increasingly enlarged electron microscope images of the cochlea and hair cells. Figure A shows a sound wave’s journey to the cochlea. But why should you trust us? We will let our patients tell you! We have More Than 750 5-Star reviews! 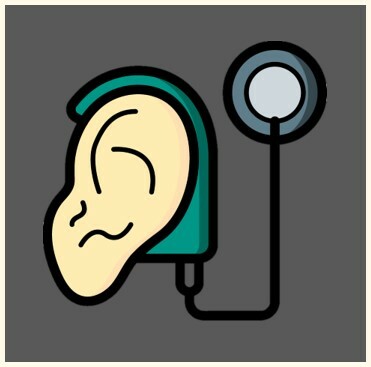 Hearing loss isn't just an annoying part of of aging. Left untreated, it can lead to dementia, social isolation, loneliness and depression. But treating your hearing loss will help you age better, by warding off the effects of harmful consequences. People with chronic tinnitus can remember what it was like to enjoy the quiet solitude of a peaceful summer day, but now that stillness is gone. 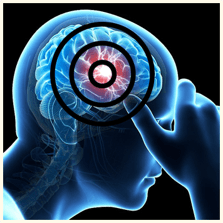 Our Doctors understand Tinnitus, and they can help you regain control of your life! 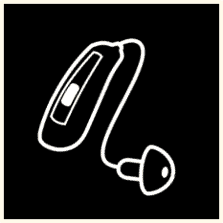 If you have a hearing loss, hearing aids can restart your journey through the sounds of life. But hearing aids will do very little if they aren't fit properly - and a precise fit cannot be achieved without Real Ear Measures. That is why we use Speech Mapping! For people with profound hearing loss, a cochlear implant offers the best option to hear sounds and understand speech without reading lips. Dr. Li-Korotky AuD, PhD, and Dr. Alison Benner AuD will support you through every step of your journey.